To paraphrase a famous poet, “Why do I love my chucks? Let me count the ways”. . . .
1. The Eyelets. The long lasting metal eyelets have been a mainstay of the chucks look and make it so easy to lace them up. Plus you get the bonus of two smaller eyelets that help the shoe to breathe inside. Converse has now recognized the importance of these little eyelets, and has even placed them on their new black shoe boxes for chucks. 2. The Stitching. Part of the distinctive look of a pair of chucks is the white double stitching that surrounds the eyelets and comes together in a square near the toe cap. (In the older vintage chucks, there wasn't a square but rather an arch of stitching.) This is made even more prominent by using canvas matching colors for the tongue and heel support stitching. However, lately Converse has been making their new models of seasonal with the same color of stitching throughout. On many of the foldover models, the stitching is the same as the inside color. Variety is okay as long as they don't mess with the look of the classic core models! 3. The Toe Guard. This extra piece of rubber at the front of each shoe is made up of a crisscrossed diamond pattern of small rubber squares at the top, and very small mini-diamonds at the bottom. You can tell a well-worn pair by how smooth these diamonds have become. 4. The Rubber Piping. These thin strips of rubber go around the entire perimeter of the shoe, where the canvas meets the rubber, and there is a second piping strip on the rubber foxing between the toe guard and the heel patch. In the past this piping was mostly black, except on the white pairs where it was red and blue, and on the blue pairs where is was blue. Lately, the trend has been to make the piping match the canvas colors, so an orange chuck has orange piping, a green chuck green piping, etc. These days, there are more pairs with piping color mixes. 5. The Inside Ankle Patch. The distinctive red, white and blue Converse All Star Chuck Taylor round patch is placed on the inside of every genuine high top, and is one of the most distinctive logos in the world. 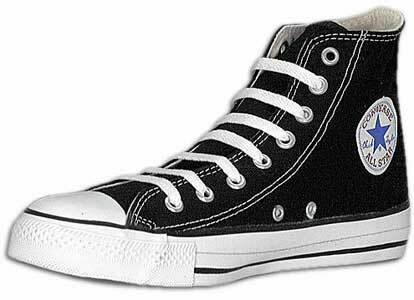 If the original Chuck Taylor had been designed for today, it would have most likely been put on the outside or on both sides of the canvas. Luckily it was made in a time when less commercialism was considered more classy. The only times the red, white and blue patch is not used is on monochrome pairs of chucks, where the logo is all black or all whatever the monochrome color is. 6. The Heel Patch. The rectangular heel patch is the one element of the Chuck Taylor shoe that has been changed the most. 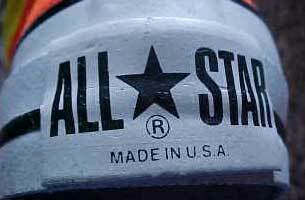 The heel patch says ALL STAR in capitals and has the five pointed star and trademark symbol in the center. The patch has been many different colors, including blue, black, and white. On many of the new models the heel patch is being made in matching colors, another change in the look of your chucks. Of course the most disappointing change was when manufacture was sent over to Asia and the Made in USA lettering at the bottom of the heel patch was removed. 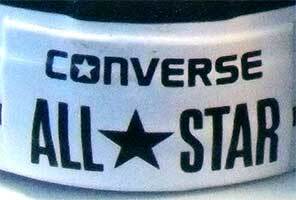 The newest heel patches which were added in 2015 include the word Converse above the words All Star and the center star. Vintage heel patch and the newest heel patch. 7. The Rubber Foxing and Toe Cap. The distinctive white rubber foxing and toe cap that forms the base of the shoe is another classic feature that makes a Chuck Taylor shoe stand out from all others. There are only a few exceptions to this look in the long history of the manufacture of chucks. Monochrome chucks have foxing that is the same color as the canvas upper, and the Made in USA faded denim models made in the late 1990s had foxing that was a light blue-gray in color. The size of the toe cap has also been an issue with chucks wearers. In the 1990s the toe cap started to get bigger in size, due to the way it was cut off, and partly due to the lower placing of the rubber piping on the front of the toe cap. Most people would agree that the best looking pairs have toe caps that are evenly cut off in a straight line, rather than edging into the tongue area. 8. The Bottom Outer Soles. This is another classic feature of the Chuck Taylor. The unique pattern of diamond shaped squares, crisscrossed lines, diagonal lines, and inside gripping notches combine to make a most unique footprint. You can recognize a chuck footprint anywhere as a result, and after many decades it still is the coolest shoe print. The sole is capped off with one more great feature, the shoe name and size inside a quarter circle in the center of the sole. 9. Many Ways to Lace. Chucks have always been distinguished by the different ways you can lace them. The classic style starts with the lace over the two bottom eyelets, then under to the second eyelets, then over and under to the top. But you can lace from under the two bottom laces for a slightly different look. Some people like to lace with alternate patterns like straight across lacing. On most new high top models of chucks, there is now a lacing notch on each tongue which allows you to insert the shoelaces to prevent slippage. And with high tops you have a choice as to how far up you lace, depending on how loose or funky you want your chucks to be. Add the element of different colored, sized, or patterned laces, and you can see why chucks are so distinctive and capable of expressing individual personalities. 10. The Canvas Uppers. This is why chucks are so comfortable, because the canvas is much lighter on your feet than leather or synthetic materials. It breathes so much easier, and after the shoes are broken in, you hardly notice any weight from the canvas. Canvas is a great artistic material. Think of all of the different color combinations and patterns you see on chucks. And you can even draw or paint your own design if you feel so inclined.